A conch is a kind of large sea snail with a heavy spiral shell. The conch (pronounced KONK or KONCH) is a large sea snail that is especially common along the coasts of Florida and the West Indies. The spiral shell of an adult conch is sometimes a foot long and may weigh as much as five pounds. When a person holds a conch shell to his ear he hears a roar like the roar of the sea. The conch has a strange way of moving about, it has a big claw on his body which it hooks in the sandy bottom, raises its shell up high, and topples forward. It can also move in a series of leaps to escape an enemy. Conch shells have many uses. 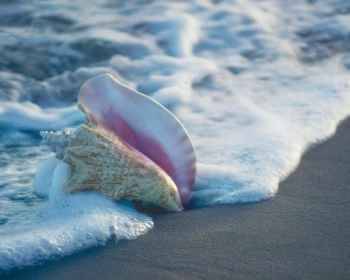 The beautiful pearly pink timing of conch shells is used to make buttons and for carving cameos. The shell of conchs known as Triton’s trumpets are sometimes made into horns and the conch’s meaty body is used to make delicious chowders and salads.